A huge thanks to Halo for sponsoring today's post! All thoughts are my own. When you think of the Halo brand, what comes to mind? Do you think 'how cute'? A must have for baby? Comfort? For me, when I hear Halo I immediately think of safe sleep. For years, Halo has been helping parents put their babies to bed safely with their varieties of sleepsacks and swaddles. Now, they are taking safe sleep even further with their revolutionary new BassinestTM Swivel Sleeper. The breakthrough design of the HALO Bassinest Swivel Sleeper provides not only a safe sleep space for baby, but also easier, more convenient sleep for mom. The dual-swivel of the Bassinest Swivel Sleeper allows it to rotate a full 360 degrees from two different pivot points. The first swivels elliptically, allowing the Bassinest to be pulled into the bed next to mom; the second rotates circularly, making it easy for mom to angle it as needed, and making it more comfortable for her to get in and out of bed. (This is particularly important to the one-third of new moms who have a C-section birth and have a longer and more painful recovery.) The unique design also means baby is always close by and visible at mom’s eye level, allowing mom to reach in and soothe baby quickly, while mesh walls provide maximum visibility and breathability. Its swivel design and patented retractable wall also help mom tend to many of her baby’s needs while still in bed for greater convenience and comfort, as well as better, more restful sleep. The Bassinest Swivel Sleeper can also help support nursing moms particularly during the nighttime. Those who have tested the product find nighttime feedings more convenient as baby can be easily lifted to the breast without getting out of bed. The Bassinest also comes with a unique nursing timer which will alert mom when it’s time to switch sides or return baby to his sleep space – which can also be done without leaving the bed. Other features include a nightlight, soothing nature and womb sounds, music and gentle vibration. Basically, it allows many of the same conveniences of bed sharing... but without the risks that can sometimes come with it. Seriously, is this not the coolest bassinet design ever? I LOVE it, and truly wish it had been around when WE needed it! 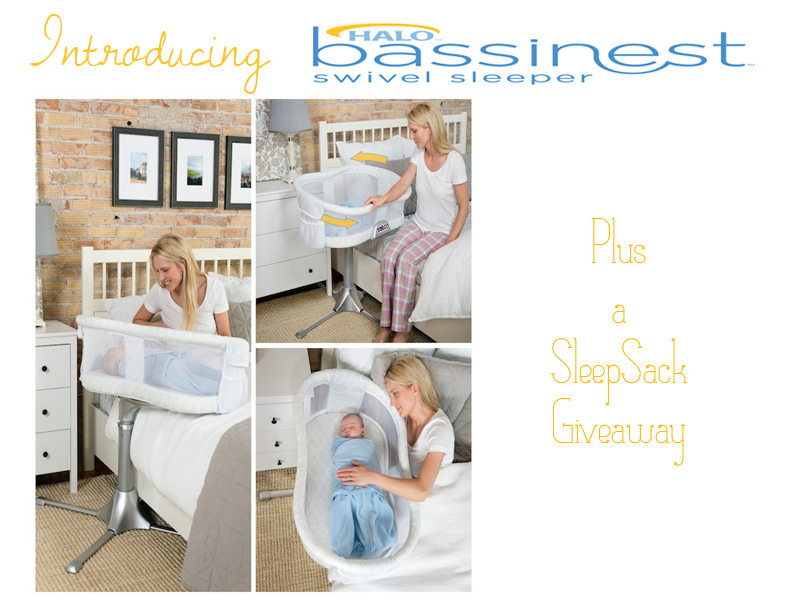 If you're expecting a little one, you'll want to check it out...and enter to win one for yourself at http://www.halobassinest.com/!! I love the swivel feature! I love that it swivels and that it wipes clean easily! The swivel feature is definitely the coolest part! I LOVE that it swivels...I have never seen anything like it! I also like that the height it adjustable! i like the nightlight feature! I love that the side lowers. I love that they sides go down for easier access to the baby. I like the fact that the side goes down so you can tend to baby easily. I like the mesh walls of the Bassinest so that baby can breathe and can be easily seen. I love that the side wall lowers and that it swivels!